What does everyone feel about doing regular meeting locations and dates? For example, we have meetings every 3rd thursday of the month afternoon at Stone Mountain Park. I get about %50 of my thursdays off and it is usually te first and third. We would do something like 6-8pm or something around that time. I also feel we should have some set schedule for open meetings anyone can attend. I know work schedules and distances have been an issue with setting up a place and time, but the lack of any publicly accessible recurring meeting has been detrimental to newcomers. 2600 Magazine meets at Lenox Mall, in the food court, same date and time regardless of who shows up. Defcon404 meets monthly at Marlow's Tavern, everybody buys their own food/drink. ZSC-001 Saint Louis meets up at a bowling alley, and we have several to choose from here, many with daily specials. (AMF, Brunswick, Stars&Strikes, etc). However, without a daily special, bowling can get expensive. We have, in the past, met up at a restaurant in a semi-private side room. Other than loud TV's, this worked well. We have also met up at a public park, both in the shade of trees and in an available pavillion. There are some gun ranges with side meeting rooms, and others with restaurants nearby, if we wanted to have a range day. Note: While WMA's like Charlie Elliot are good outdoor options (if a long drive for some), they are also pay-to-use or permit based. While some members may have and make available an 8-person GORP, Georgia Outdoor Recreation Permit, it can still be a deterrent to the casual attendee. Various radio groups have long standing agreements with organizations such as the Red Cross, a local fire station, or church to host their meeting space at no charge. They seem to have this down to a science, and we could ask if any are willing to give us tips. Stone Mountain is also a good choice, as it's a very publicly accessible, well-known landmark. However, there is still that pay-to-use barrier, which is $15 per vehicle (free if you can walk or bike there, or $40 annually for a parking pass). I'm okay with the 3rd Thursday of each month, at 6-8pm. 3rd Thursday, 6-8 works for me. I'd be willing to spend the $40 on an annual parking pass for Stone Mountain, but I completely understand if that's a no-go for some people. Stone Mountain does seem somewhat central-ish for everyone. If we start using one single location for most of our meetings, I have no problem making those open to the public, or every other one open to the public, or something like that. At least for now. If we start seeing 10+ new faces at our public meetings, then we might have to start creating completely separate meet and greets. Introducing that many people and discussing ZS basics with them would cut deeply into the actual meeting time and prevent us from making meaningful progress on agenda topics. For specialized/skills based meetings like range days or meetings on private property, those would be member/officer only. Don't want randos showing up to my apartment, or to range day when we haven't established any sort of relationship with them. Pick something that works for you, the most active people. The rest of us will attend when we can. I agree on general meetings announced in advance and open to the public, with some screening for special focus meetings on private property or at ranges. Davo wrote: Pick something that works for you, the most active people. The rest of us will attend when we can. Every 3rd thursday works for me about half the time as my schedule goes, but I'm sure I could work something out to get that day off regularly. I'll talk with A Zombie and see if we can start this in August. Davo wrote: Any meetings coming up? I'll try to see if there is a day I can run one. Maybe we could go to Hard Labor creek and have the Augusta Lockpicking group let us do some hands on. I'll find a day and contact them. Sorry guys, I've pretty much been dead to the world for the last month or two. New job+ new puppy+ Nukelanta event. I'm down for a meeting in November to start planning 2017. It would be nice to discuss/share progress on a HAM net, BOB hike, MBO, blood drive, and a number of other things we've been trying to work on this year. My schedule is a little screwy with this new job, so I'd have to know far enough in advance to try and get an evening off. We will see what we can do. I'm not sure what my schedule looks like as of now. A November meeting would be nice. Since Conyers was a central location for most of us, I looked into their library and found their hours and meeting spaces. They have small study rooms that are first come first serve basis. They also have a large meeting room that seats up to 300 people that can be rented and has restrictions like no sales. I'll try to post my available days off for November and see if we can get something together. If this place works we could do preparedness lectures here free to the public. http://conyersrockdalelibrary.org/?page_id=234 Source of my information. My only days off this month are November 14th and 28th. Does that work for anyone else? I guess not. And so we see how much work it takes to keep a healthy, active chapter going. One of the Black Friday deals I managed to pick up this year was a new 10'x10' canopy tent, similar to the one I've already got, except this is in black. Hard to beat 50% off. 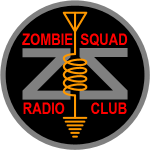 My plan is to draw up some white lettering in stencil font to say "ZOMBIE SQUAD" and the ZS logo along the flat edge on all 4 sides, to give additional signage to our table, wherever we end up. I'll run it past the admins to make sure I've got copyright approval and such. Weren't we supposed to have officer elections sometime close to the end of the year? Officer elections were supposed to be September, but we never really did anything in the last few months, so it fell by the wayside.